The roots of modern gemstone cutting date back to the Renaissance when techniques were discovered that allowed jewelry craftsmen and goldsmiths to cut and polish hard stones like diamond and sapphire. Minerals and gemstones are graded for hardness by the Mohs Hardness Scale. As the scale progresses from 1 to 10, the minerals get harder. Each grade of hardness can only be cut by a mineral or substance that is higher than it on the scale. Diamonds, sapphires, and rubies are at the extreme, hard end of the scale meaning that they can only be cut with diamond blades. Diamonds have an octahedral shape in nature, meaning that they resemble two pyramids with fused bases, while sapphires and rubies are slightly different. It should be noted that chemically, sapphires and rubies are grouped together as a mineral called corundum. The difference in color results from different trace elements that are inside each one. In the early days of gemstone cutting, a common practice was to cut off the points, producing a square shaped gemstone with a flat area called a table. While this method produced acceptable results, the stones were not as radiant or fiery as modern cuts because they were not cut in a way that dispersed light properly. It was not until the early 1900s that the first round brilliant cut diamond that we know today was perfected. Round brilliant cuts are the most popular gemstone cuts in existence today, accounting for nearly 75% of the stones on the market. This is because the cut maximizes the amount of light that is reflected internally and externally through the gemstone, producing sparkle and fire. In the early 1980s, gemologists and jewelers experimented with techniques that could produce the same sparkle and fire of a brilliant cut, but in a square shape. The result of their experiments is the modern princess cut, the successful fusion of the square cut and the round brilliant cut. In recent years, the princess cut has gained popularity among both people shopping for engagement rings as well as for jewelers. For the jeweler, the cut produces very little waste, maximizing the amount of raw carat weight that can be preserved. For brides to be, the princess cut is the second most popular cut of gemstone next to the round brilliant. The princess cut is square or octagonal depending on whether or not the corners have been trimmed. Today’s princess cut has at least 58 facets, but may have as many as 114, depending on the stone cutter and the size of the raw gemstone. Ideally, the princess cut gemstone should be perfectly square or octagonal, but minor variations do exist. Diamonds, rubies, and sapphires are the most popular gemstones used for princess cut engagement rings. Emerald, the other popular gemstone, does not lend itself well to being cut with multiple facets as the stone cracks easily and typically has many internal flaws. When jewelers and gemologist grade diamonds and colored gemstones, they rate them by a group of characteristics called the Four C’s. The Four C’s pertain primarily to diamonds, but colored gemstones can also be evaluated by these characteristics with the addition of the grading of their color based on clarity, tone, and intensity. The first “C” refers to the carat weight of the stone. Generally, the larger the carat weight of the stone, the more expensive the stone is, although smaller, more flawless stones can cost more than flawed larger stones. The next “C” is clarity. Clarity refers to the clearness of the stone. The more transparent and clear the stone, the more light can pass through it unobstructed. Stones with high clarity are more valuable than cloudy stones. The third “C” is color. For diamonds, the scale is alphabetical and runs from D to Z with D grade diamonds being the highest quality. As the scale progresses from D to Z, the color of the diamond goes from clear and transparent to pale yellow. For colored gemstones like rubies and sapphires, additional qualifications for color are made. These extra criteria include color grade and tone. The color grade is how intense the color of the stone is. In other words, it is an arbitrary measure of how red a ruby is or how blue a sapphire is, for example. The truer the color, the more valuable the stone will be. The tone of the colored gemstone is important as well. The tone of a colored gemstone refers to how light or dark the stone is. A medium tone is preferred as a stone that is too light will look too clear, while a stone that is too dark will appear too opaque. The final “C” represents the cut of the stone. Often overlooked, the cut of the stone is as important to the final price of the stone as the other factors. A well cut, lesser quality stone will in many cases look better than a poorly cut, higher quality stone. Different cuts harness light better and showcase the stone’s natural fire and sparkle more effectively. The princess cut is one of these cuts, providing a lot of flash and sparkle from any diamond, ruby, or sapphire. Princess cut gemstones are popular choices for engagement rings because of their beauty and style. The most common stones that are cut using the princess cut are diamonds, sapphires, and rubies. Diamonds are by far the most popular gemstones used in engagement rings. When buying loose diamonds for an engagement ring, there are a few things that should be kept in mind if the purchaser wishes the diamond to be cut with the princess cut. The princess cut is a quite forgiving cut and can hide many flaws that a gemstone may possess. Therefore, it is possible to buy a lower quality stone if constrained by a budget. Other cuts like the emerald cut are not as forgiving and require the buyer to purchase high quality, expensive stones in order to avoid having a stone’s internal flaws visible to the naked eye. The first consideration when buying a stone is to look at the carat weight. The more carats the stone weighs, the more it will cost. For a clear, flawless grade D diamond, the going price per carat can be more than $10,000. After the size of the stone, the next most noticeable characteristic about the stone is its color. Diamonds are graded on a scale from D to Z, with grade D diamonds being the highest quality. When choosing a diamond for a princess cut, buyers can choose lower color graded diamonds and save some money because the cut can hide many of the flaws in the stone. For people on a budget, the minimum color grade that can be chosen that will provide a nice looking stone is grade I. If not on a budget, engagement ring shoppers should look for diamonds starting with a color grade of G. For colored gemstones other than diamonds, buyers should look for stones that have intense, deep, and vibrant color. The clarity of the stone is also important. If a gemstone is clear, light can pass through more readily and allow the stone to shine and sparkle more. Natural gemstones have flaws inside of them called inclusions. The less inclusions that a stone has, the clearer and more valuable it is. Diamonds are graded on a scale ranging from internally flawless (IF) to heavily included. When purchasing a princess cut diamond, the minimum clarity should be SI2 (slightly included). Finally, buyers should take notice of the table size and the depth of the stone. These measurements are marked by percentages and vary from stone to stone. The table size refers to the size of the top facet of the stone. For a princess cut, the table size should be between 58% and 77%, although between 53% and 85% is acceptable. A table that is too large will make the stone look glassy and fake, while a table that is too small will take away from the sparkle of a gemstone. The depth of the stone refers to the overall height of the stone. The depth of the stone should be between 58% and 77%, although depths between 56% and 84% will produce adequate results. If the depth is too small, the stone will appear smaller. 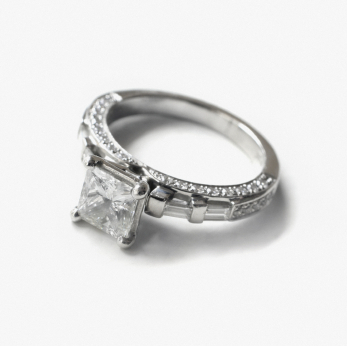 Princess cut rings require a four pronged setting in order to keep their corners protected from chipping. Although gemstones like diamond and sapphires are hard, they are still brittle and can chip. Why Choose a Princess Cut? Princess cut engagement rings have been gaining in popularity in recent years, second only to the traditional round brilliant cut. One advantage to choosing a princess cut stone is that lesser grade stones can be used to create this cut, saving money and allowing the buyer to purchase a larger stone. Next, the princess cut produces the least amount of waste from the raw gemstone. The princess cut also looks beautiful. Due to the unique way the facets are cut and the sheer number of them, a princess cut stone can look more beautiful than even the round brilliant cut stone. This can make an inferior quality diamond seem like it is more valuable than it is. Finally, often women prefer square cut stones over round ones because they can accentuate their fingers better, producing and elegant and timeless look. Princess cut gemstones can be found at any reputable jeweler. It’s important to make sure that each stone has the proper grading and documentation attached to it. The princess cut is a popular cut of stone that is sure to please any future bride. It’s timeless, classic, elegant, and simply stunning.